I see at the post, Some Serious Confusion About Kirznerian Entrepreneurship, confusion continues. I submit the following comments made in response to the post for discussion, with my responses in blue. It may appear obvious but it is not necessarily true. Suppose, I have $100 in my pocket but know of a capitalist that will fund one million dollars to a project while another person has $100,100 for the same project but is not aware of any capitalist that will fund him the $900,000. Thus, the person with $100 in his pocket can get the project off the ground while the person with $100,100 can not. Of course, a project requiring $90,000 might be easier for the person with $100,100 in his pocket to fund. But the point here is that the person with the largest personal supply of cash is not always at the advantage. Consider a situation of an auto financier who has a business that provides full funding for low priced autos. Also, consider an entrepreneur who sees a great opportunity to provide food delivery by car. The entrepreneur may obtain financing from the auto dealer to purchase a car for his business with the auto dealer never making a decision on the business the delivery entrepreneur has in mind. In leveraged buyouts, you will often see certain loans provided by capitalists based on given assets without the capitalist making any decision on the soundness of the overall LBO. In other words, if the above capitalists existed but the entrepreneurs did not, the delivery business and the LBO would have never gotten off the ground, even if the capitalists as part of their daily business would be willing to make such loans. It does not appear, thus, that Kirzner overstates the role of the entrepreneur. He identifies how the entrepreneur qua entrepreneur plays a very important role in actions that would lead to businesses that would not otherwise exist. I also think that Kirzner's view of entrepreneurship is too narrow. I have never liked his notion of "alertness to opportunity," because it seems to imply that entrepreneurship only involves existing opportunities growing on trees waiting for an entrepreneur to come along and pick them off; while some in the population walk by these trees without noticing the hanging fruit, entrepreneurs are very attune to the existence of this unpicked fruit. Kirzner never suggests that entrepreneurship only occurs when individuals spot low hanging fruit that others miss. He, in fact, expands the notion of entrepreneurship to include these types of opportunities. It also seems to imply that entrepreneurs cannot make losses, as they're only taking advantage of existing profitable opportunities. How can entrepreneurs make losses if they don't have capital invested in a project? So what? All action is made under uncertainty, so there is no major insight here. Are we to limit the definition of entrepreneurship to a game of pitch and toss, overtime, where you sometimes win and sometimes lose because of uncertainty? What then shall we call the person where uncertainty approaches zero and say who knows he can buy an item at a flea market for $1.00 and sell it to another vendor at the other end the flea market for $5.00? What about the stock trader who notices he can buy a thousand shares for a dollar cheaper than price X with one dealer and simultaneously sell the thousand shares to a different trader for price X ( I personally know a trader that looked for nothing but these opportunities and traded himself into becoming a multimillionaire. He virtually had no time exposure or uncertainty exposure). An entrepreneur may spot an opportunity overtime but that is not the essence of entrepreneurship. And again, capitalists face losses, entrepreneurs qua entrepreneurs do not. [Kirzner] states is has to do with creativity, rather than just discovering something that's out in plain view. As a point of clarification, Kirzner objects to Schumpeter's creative destruction perspective. He places creativity in a disequilibrium world under the umbrella of his general alertness view of entrepreneurship. Kirzner's perspective is far from just creativity but creativity is part of it. Entrepreneurship requires capitol [sic] but to be an entrepreneur does not require an entrepreneur to supply capitol [sic] directly. The entrepreneurial element has nothing with adding labor because one has no funds. The essence of entrepreneurship is understanding how capital, goods and labor can be put together to gain a profit. Whether capital, goods or labor are provided by the entrepreneur is beside the key point of entrepreneurial alertness. So if I understand your thesis, Robert, it is that if policymakers become convinced that Kirzner is right, then they will stop welfare handouts to the poor. The point is not that policymakers who survive off the current welfare state will suddenly abandon their perspective but that those who value clear sound analysis will have in Kirzner a clear sound analysis to contemplate. How this theory is advanced to the masses is a different question. But if only some people have the natural ability to be an entrepreneur, doesn't your thesis require policymakers to be able to differentiate between the poor who are entrepreneurs and the poor who are not? It depends upon the argument. If the argument is that capitalism oppresses, say, blacks because they don't have capital, then Kirzner blows a hole through that argument without having to identify those who will become entrepreneurs. It is a type of class war that Kirzner destroys by his theory. Or, if everyone is regarded as a potential entrepreneur, then is your thesis any different in effect from the broader one espoused by "limited government" types, namely, that if you subsidize sloth you get more of it? What? Who says everyone should be regarded as a potential entrepreneur? The point is, once again, that lack of personal capital can not on Kirznerian grounds be blamed for the inability to become an entrepreneur. It thus suggests the rejection of any special funding or other programs to "help" poorer classes because they do not have personal funds. Kirzner's entrepreneur model, thus, is in addition to the perspective that if you subsidize sloth you get more of it. It pulls out from under the rug those who want to provide aid packages to minority communities, which implies that entrepreneurs would not be able to function and build on their own without government assistance. No, the thesis does nothing other than provide a weapon to show thinking people that there are further reasons why supplying funds to the poor makes no sense. You are confusing the greater recognition of understanding with the battle itself, They are two separate things. There is no stand-alone entrepreneur or capitalist. A capitalist who advances funds to finance a given line of production exercises future-oriented judgement regarding present resources (entrepreneurship). But the capitalist may be doing so without any thought to the project of the borrowing entrepreneur. (See the delivery car/LBO discussion above). He may be from the perspective of the borrower, and correctly so, be a capital source without any opinion on the entrepreneurial project at hand. A financier of cars may gain extremely narrow profit over current theoretical risk-free interest rates, while funding a spectacular profit opportunity of an entrepreneur who is using the dealer as a funding source. They may not generally stand alone but dance to two very different beats. And consider this entrepreneurial situation. A high school student I know discovered a book on Amazon that was listed as out of stock. He found a source where the book could be had for $15.00. He offered the book on Amazon for $30.00. When the orders flowed in (and they did), he immediately provided the name and address of the buyer and had the book shipped and made a nice profit. At the time, I am not sure it is current Amazon policy, he was paid immediately by Amazon and he used those funds to pay the source. Thus, you had a situation where no capital was required. So the idea that an entrepreneur can not stand-alone without capital and make a nice profit does not seem to even be the case in small situations. But this ignores what investment bankers, hedge fund managers and private equity people do on a daily basis. But because of my contract with the moneyed unvestor, I have become a capitalist since I now own 20 percent of the firm. Rothbard here simply exposes that he has not seen many hedge fund contracts or private equity contracts. Many hedge fund and PE contracts do not pass on to the managers capital but simply a percentage of profits with no exposure to losses, Which violates Rothbard's own definition of a capitalist as someone who must be exposed to profit and losses. However such hedge fund and PE managers fall nicely into the Kirznerian definition of entrepreneur since they spotted opportunity, put the deals together and did not necessarily use any of their own funds. Entrepreneurs act now to create something in the future by engaging in the process of forgoing present consumption in order to reap future rewards (capitalism). This is why Rothbard (correctly) identified the role of the capitalist-entrepreneur. You can't have one without the other. So what do you call those that do not forgo any of their current consumption but engage in entrepreneurial acts with borrowed money or other investor capital, do you deny such people exist? As Peter Klein, Joe Salerno, and Walter Block have noted, there is no such thing as an entrepreneur who isn't a capitalist nor a capitalist who isn't an entrepreneur. 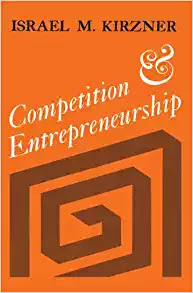 Klein, who zooms in on the Austrian conception of entrepreneurship, has shown that entrepreneurship is a matter of judgement regarding the use of scarce resources with respect to what Salerno calls future-oriented appraisal of consumer demand. Again, what do you call those that do not forgo any of their current consumption but engage in entrepreneurial acts with borrowed money or other investor capital, or do you deny such people exist? Kirzner's notion of entrepreneurship as alertness misses these crucial elements. Very little (to none) of Kirzner's theory has to with the Misesian understanding of future-oriented action. His [Kirzner] winning the Nobel, rather than e.g. Rothbard, would be something like Hayek winning in '74, rather than e.g. Mises. This is just absurd. Hayek was specifically awarded the Nobel for among other things his work in business cycle theory which was built on the work of Mises (though different in some ways). There are dozens upon dozens of Hayek references to the work Mises had done in business cycle theory. It was very easy to think at the time of the announcement, "Wow, Hayek is getting the Prize for work originally developed by Mises." No one is going to think "Wow, Kirzner is getting the Prize for work originally developed by Rothbard." First, Kirzner does not build his views on top of Rothbard's. He takes his perspective in an entirely different direction. Second, in Competition and Entrepreneurship, Kirzner cites Rothbard just once, in a footnote. Rothbard's discussion of entrepreneurship was pretty much limited to what he wrote in Man, Economy and State before Kirzner's Competition. No one upon hearing the name Rothbard would jump to the conclusion, "the man who developed entrepreneurial theory." You would say that about Kirzner just as you would say that about Mises on cycle theory based on his book The Theory of Money and Credit and several important essays. Rothbard deserved a Noble Prize for pathbreaking work in business cycle theory, monopoly theory, intellectual property theory and theory as to the nature of government, just not for entrepreneurship. Robert, I don't think that any of your examples are convincing arguments that one can be an entrepreneur without capital. In the Amazon situation, the student was at risk in terms of capital; if the supplier at $15 did not come through, the student would have had to procure a book elsewhere to supply it at $30. No capital may have been required ex post, but ex ante he had capital at risk. In the case of private-equity and hedge-fund managers, their investors always require them to make a personal capital commitment in their funds, to ensure that they are aligned with the investors. In the case of investment bankers, if they are acting as pure advisors on deals, then it is their clients who are the entrepreneurs (one can make an advisory fee without being an entrepreneur, in the sense that it is the capital-providing client who ultimately makes the "go/no-go" decision); if they are running an IPO or debt offering, then they are using their own capital to buy the securities before reselling them to institutional investors. You are wrong on all counts. You have no idea what you are talking about. The student could simply cancel the sale and report it out of stock to the Amazon buyer. This has happened to me on more than one occasion. there is no risk for the student. Although, some hedge fund managers and PE managers put their own money along side investors, this does not happen all of the time. You are wrong here. You have no idea how investment bankers operate. Just one example. IBs don't buy IPO securities and resell them to institutional investors. You are really talking out of your hat here. In fact most IPO deals are structured where IBs do not buy-in to IPOs except via what is known as an over-allotment where the IB is almost always guaranteed a profit by only buying AFTER the stock is public and the market price is above the IPO price. Like I said, the anti-Kirznerian entrepreneur theorists are operating in an academic-style environment with no idea of how deals are done in the real world. 1. Can an entrepreneur who doesn't risk his own capital ever make a loss? 2. If someone who risks his own capital can be an entrepreneur, and someone who doesn't risk his own capital can be an entrepreneur, who is NOT an entrepreneur (how useful is the concept)? An entrepreneur provides knowledge of how and when to combine capital, goods and labor. Whether the entrepreneur provides any of the capital, goods and labor or takes on risk is secondary to what an entrepreneur is.